the seekers, the unlettered as well as the learned. Though the Swami did not teach anything, the mere fact that he was taking cognisance of what was going on around was enough to draw people who naturally assumed that such an embodiment of tapas was bound to have great wisdom. Those interested in spirituality and yoga approached the Swami with their doubts. It was natural for the merciful Swami to respond to them. Yet, in order to teach in a manner intelligible to them, it was necessary for the Swami to have an acquaintance with the accepted terminology as laid down in traditional texts. It was also necessary to explain matters in a manner that would enable the listeners to understand and practise them. 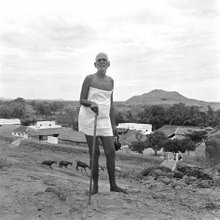 For this purpose it became necessary to have a look at the Sastras, not for himself but for the sake of others. Though established in "That from which the mind and word turn back," in order to explain about That, employment of words was unavoidable. For this reason also the Swami had to consult scriptural texts. One of those who came to serve the Swami after he reached the Virupaksha cave was Gambhiram Seshayya, municipal overseer. Right from 1900 he was a regular visitor to the Swami. He was a Rama bhakta [?] who constantly chanted Rama's name. He looked upon himself as a servant of the Swami and swept the cave regularly. As he had interest in yoga he studied Rajayoga of Swami Vivekananda and other texts; he also studied the Rama Geeta in English but he could not master them. As his knowledge of Sanskrit was poor he had a large number of doubts-in order to get them cleared, he would bring those texts to the Swami, who read them and wrote down their substance in Tamil on small pieces of paper. Thereupon Seshayya would raise further questions for which also the Swami gave answers in writing. Seshayya preferred the ashtanga yoga marga whereas the Swami advocated the path of enquiry. The former also attached great importance to pranayama [?]. The Swami realised that it would not do to convert such a one suddenly to his way. So while he clarified the points of Vivekananda's Yoga he also stressed the importance of the ultimate goal. Yoga practice was for the purpose of achieving concentration, whereas the Self could be experienced only after the mind was eliminated. If the Self was experienced what further need was there for the mind? collected them all and gave them to Sri Natanananda who rewrote them in the question and answer format and published them as Vichara Sangraha (Spiritual Instruction) in Tamil. This was translated into Telugu by Swami Pranavananda and into English under the title Self enquiry. In Vichara Sangraha the Swami also showed how ashtanga yoga could be used as a help to the path of enquiry. Similarly, a pandit from Chidambaram brought Sankaracharya's Vivekachoodamani in Sanskrit. By then a poetic Tamil translation of the book was available and brought by Palaniswami. At their insistence the Swami put it in Tamil prose for which the Sanskrit book was helpful. Uddandi Nayanar who left the Swami while he stayed at Gurumurtham could not return for seven years, till 1904. He offered his entire savings of one hundred rupees as gurudakshina to the Swami who, while appreciating the devotion of the disciple, declined the offer as he would have nothing to do with money. Uddandi Nayanar was insistent and left the amount with Gambhiram Seshayya, who was then looking after the affairs of the ashram and requested him to use the money for any purpose approved by the Swami. For several years the money was not utilised. Once, while cleaning up the Virupaksha cave the manuscript (of Vivekachoodamani) was noticed. Seshayya's nephew, Krishnayya, prevailed upon the Swami to complete the text. It was a free translation of the Sanskrit original and the Swami added a preface containing the essence of the work. The book was printed with the money donated by Uddandi Nayanar. Alongside the writing activity the study of Vedanta was also going on. On the hill there was a sadhu [?] Padmanabha Swami known as Jataswami who had a number of books on Mantra sastra, Ayurveda, Vedanta Sastra and several other Sanskrit works. The Swami would visit Jataswami's residence to study them. One reading was sufficient for him to grasp the contents as well as to remember them. The Swami also discussed these topics with pandits and thus acquired a knowledge of scriptural texts. Even experts in various sastras would visit him to get some points clarified. Thus the Swami picked up Sanskrit, Telugu and Malayalam by speaking to various persons in those languages. To start with he learnt by mere hearing, but in course of time he began learning through a study of books which enabled him to acquire a good command of all these languages. "The seeker of knowledge does not achieve his end merely by a study of the scriptures. Without upasana there cannot be attainment for him; this is definite"
The purpose of learning the sastras is to ensure that one acquires the capacity to discriminate between the true and the false. To assume that salvation lay only in such knowledge was wrong, according to the Swami. In his teachings also the Swami never followed any tradition. He did not need anyone else's opinion. For him his own experience was the basis. He quoted his own experience in discussions or in teaching because the listeners had faith in his experiential knowledge. For his devotees, he was the standard. His way was the path to nonduality (advaita [? ]), his method was one of critical analysis, not mere logic. For this reason dogmatists of various schools were never satisfied with him. If they came to him to show off their learning, the Swami became silent. They would argue endlessly but with no response forthcoming they would depart disappointed. The Swami was an expert in practice. We shall say more about this in the pages that follow.